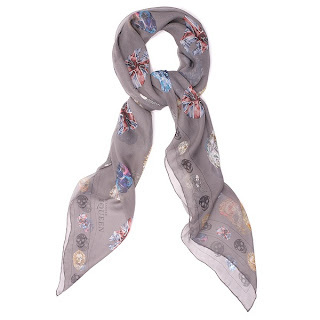 Although Alexander McQueen is sadly not with us any longer, his legacy continues through the work of designers such as Sarah Burton at his fashion house. Here are my favourite pieces from the Spring/Summer 2011 Collection. 1. 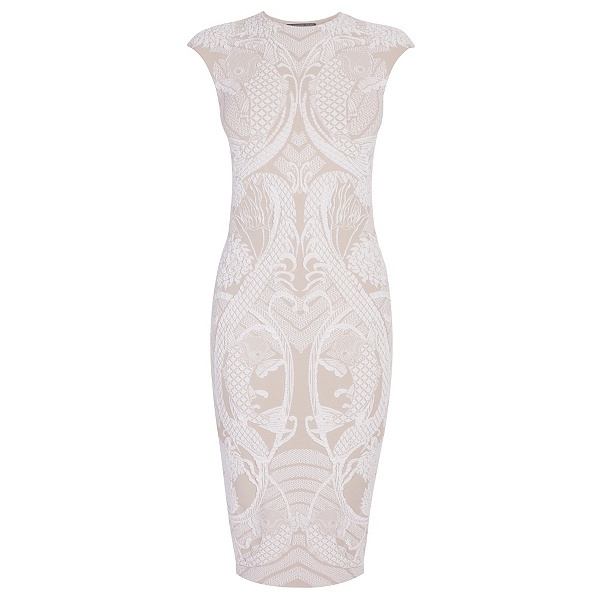 Embroided Fin Mini-Dress - £3540.00 - Here. 2. Engineered 3D Koi Jacquard Knit Dress - £895.00 - Here. 3. 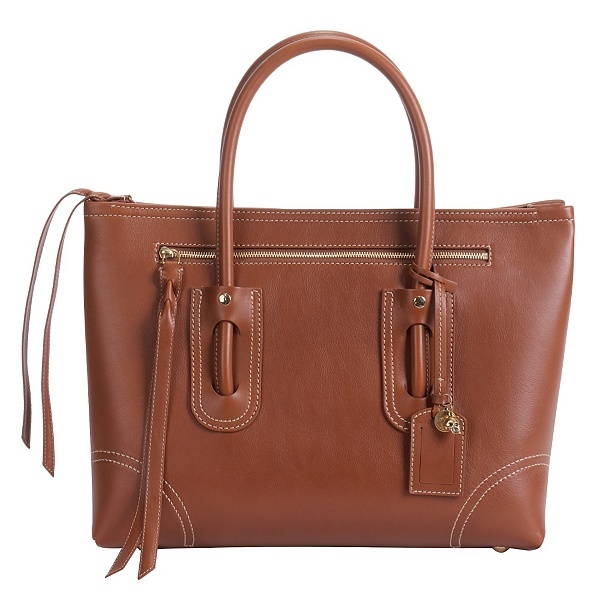 Tan Folk Medium Tote - £950.00 - Here. 4. 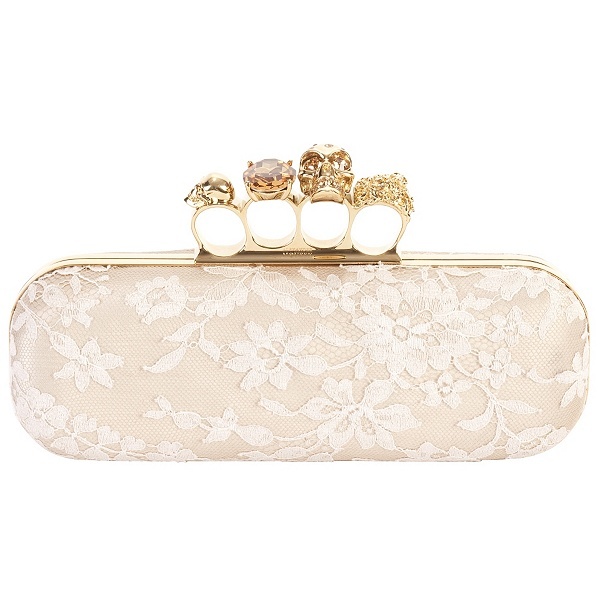 Flesh/Ivory Lace Knuckle Box Clutch - £1285.00 - Here. 5. Red Samurai Skull and Ribbon Silk Scarf - £380.00 - Here. 6. Alexander McQueen Exclusive Multi-Skull Scarf - £290.00 - Here. 7. 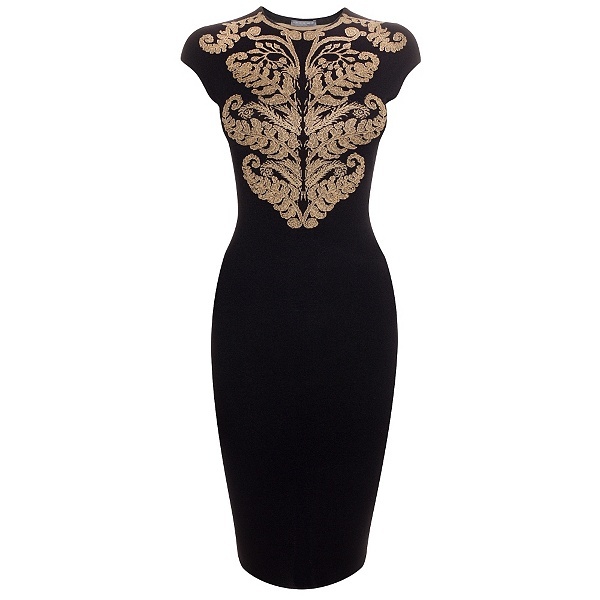 Military Fern Jacquard Knit Dress - £840.00 - Here. 8. Black Jersey Embroidered Top - £495.00 - Here. 9. Tan 3D Flower Wedge - £625.00 - Here. 10. Ivory Double Buckle Western Belt - £495.00 - Here. 11. 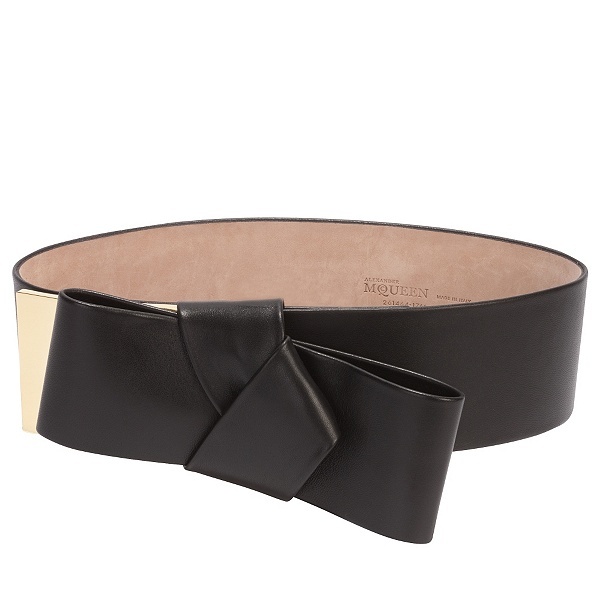 Wide Leather Obi Belt - £395.00 - Here. 12. 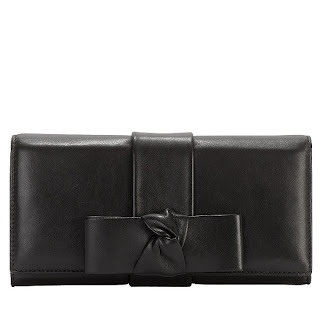 Obi Wallet - £345.00 - Here. Alexander McQueen was a genius and sadly missed, but so glad that Sarah Burton has taken over the reigns. Thank you for sharing a showcase of past runway exhibitions. I will love him forever! His designs were breathtaking! I loved Kate's dress, it was pure perfection! Your pics here are amazing! Thank you so much for your comment! I like your blog a lot and I will follow! 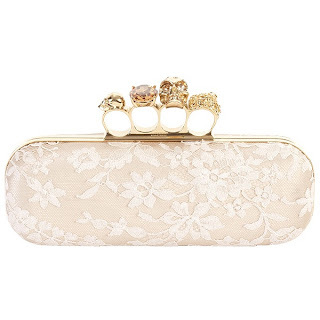 i love the clutch!!lovee!! :)great post my dear and i find your blog soo nice! Follow mine if u like it?i'll do the same back!i'd be very happy to follow each other..
Love McQueen, loved Kate Middleton's dress. What are you think about to following each other? I was so glad when she stepped out in McQueen and she looked absolutely beautiful! If only Alexander was still around to see Kate wearing that dress! He would have been really proud! Hi Pippa! Oh yes, I enjoyed the royal wedding so much!!! Beautiful couple! And I liked your posts about the wedding, too! Thanks for your nice comment and have a BEAUTIFUL day! I'll be back! it was the right choice and the day was just magical. Gorgeous. Love the white dress on the right! I love your blog and I follow you from now. 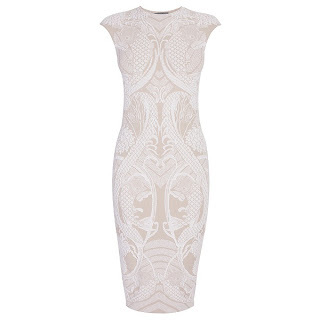 i was so delighted when Kate chose a McQueen dress! i actually covet the belts you've posted and all the pieces are beautiful! Thanks for stopping by doll. KAte looked amazers in her Sarah B dress and so did Pippa! Gotta love McQueen, he was a true fashion legend. a. mcqueen was a big artist! i love her scarfs! May he rest in peace. That man was an amazing artist. Alexander McQueen will always be missed - I still ask myself why such a thing could have happened. Such a tragedy really. I was just admiring his 3-d knuckle duster clutch (so fun!) That fashion house will continue to produce great stuff and yes loved Kate's gown! 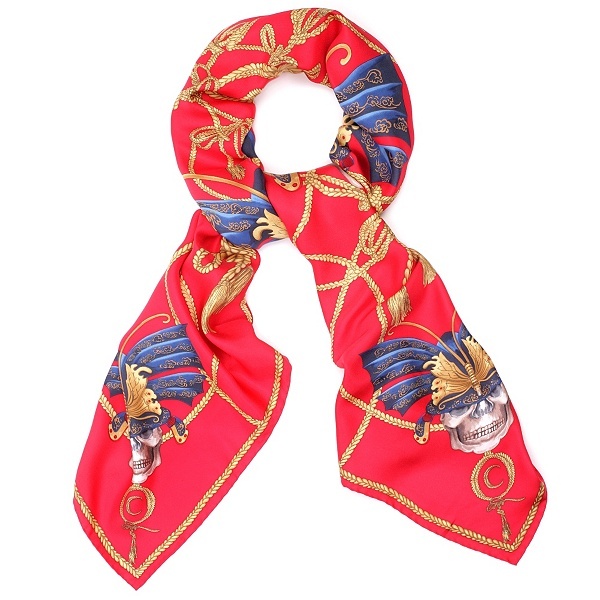 loooooove alexander mcqueen! i hope to own one of his pieces one day! the SS99 show was fantastic - you really can;t beat it!! The second dress is stunning and those shoes are amazing. I want! I love the leather clutch ! these are such gorgeous pieces, i'm drawn to the bags!